The Talking Toaster page has received far more attention that I ever imagined. Dozens of people have contacted me asking me about the project, about using this speech recognition chip or that, or other questions. Below are the most frequently asked questions and their answers. If you have a question about the Toaster project, you might find it answered here. Otherwise, please feel free to send me mail at corin@the4cs.com. Where can I get an ISD1000A? The ISD audio chips are a common voice record/playback chip. They can be purcahsed at Radio Shacks, as well as through many electronic mail order firms. The chip costs anywhere between $10 and $20 each, and is usually found in a DIP. Where can I get an HM2007? Images also has an online catalog; the page for the Speech Recognition Kit lives at http://www.imagesco.com/catalog/hm2007/SpeechRecognitionKit.html. I paid about $35 for each part, in 52 pin PLCC packaging (48 pin DIPs also exist, but availability varies). You said that the Hualon documents are inaccurate in places. Can you give more detail? The assembly code that I wrote for the toaster. In particular, where the chip and the specs seem to differ on behavior is in sending commands to the chip, what the exact handshaking protocol and timing is. The asm code has subroutines inK, outK, inST, outS (near the bottom of the code) that are a little different from the docs but were the only way I could get the part to function properly. A transcript of the HM2006/2007 FAQ that Images provided me. I've added a few small notes to it as well. 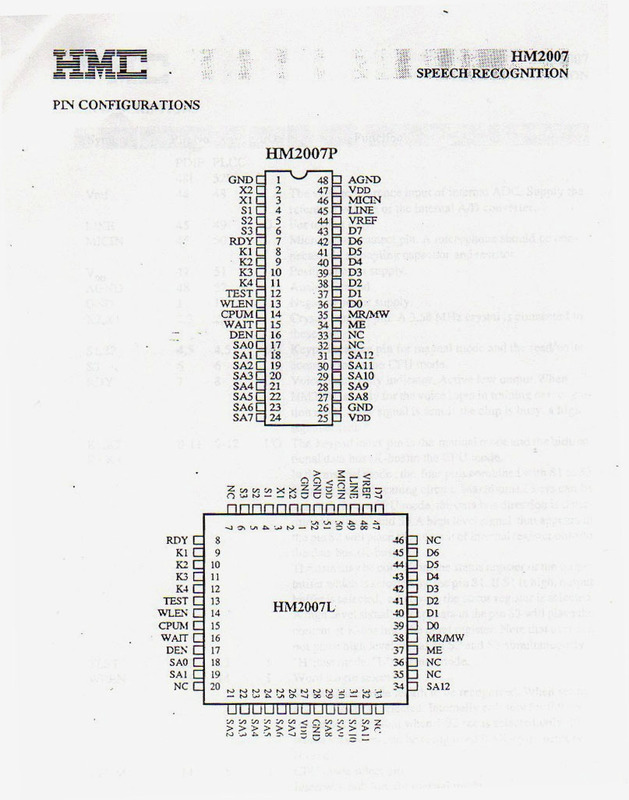 A pointer to an article in the Computer Applications Journal from 1994 in which Jeff Bachiochi experiments with the HM2007 as well. (Thanks, Mohammed!) I didn't have this when building the toaster, but it would have been useful. Mr. Bachiochi had several similar problems to mine with using the HM2007. What other stumbling blocks did you find while building the toaster? Probably the most important part of a speech recognition system is the audio input circuit. If the mic input signal is noisy, then the speech recognition chip has no hope of being accurate. Isolation from noise from the circuit. The crystal that clocks the recognition chip and/or the microcontroller can introduce noise on the wires that causes interference. A few well placed capacitors can usually eliminate this problem. Consider the operating environment. If you know that the system will be used in a relatively quite environment, don't design the circuit in a lab with, say, a loud air conditioner that's always running. If you do, then you run the risk of tuning the circuit to run optimally with that background noise. This scenario is exactly what bit me for my final project demo (yikes!). Does Hualon have a web site? What are the pinouts for the HM2007? A picture paints a thousand words, or, in this case, 48 + 52 pins: HM2007 pin configuration (includes both DIP and PLCC). What other voice chips are on the market? How do they compare to the HM2007? There are several other speech recognition chips available. A few that I know about include the OKI MCM6679A, Sensory Circuit's ??? ?, and one from Motorola (the Lexicus, I think). The shortcomings of these circuits were either that they weren't available in sample quantities, or that they had to be pre-programmed in ROM with their vocabulary (leading to a huge initial cost outlay). The HM2007 had neither of these downsides. Do you have any plans on manufacturing or marketing the Talking Toaster? Presently, I have no intensions of producing any more Talking Toasters.